To remove the differential monostrut you don't have to take out the fulcrum bolts. At least I don't see how this helps to remove the monostrut. The monostrut is fixed by two bolts #15 to the body and two bolts #7 to the upper mounting points of part #6. All you have to do is to remove #15 and #7 bolts, loosen or remove the sping pan bolts so that you can drop the rear axle a bit. Maybe you also have to loosen the 2 big bolts going through the huge a-frame bushes to free up some more space. Doing so you'll have enough space to manoeuvre the monostrut off the car. Don't forget to support the rear axle before loosening the bolts for dropping the axle. You are correct after I think about it. I also need to pull the bracket #6 from above since the x300 does not have one and I need the fulcrum bolts for future use. 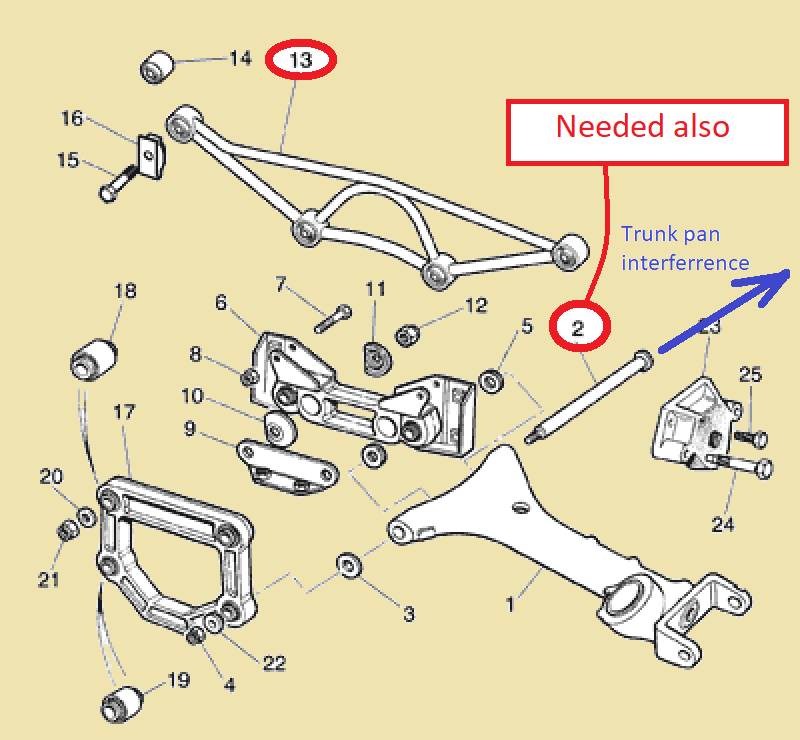 I think that I will have to jack up the tires to relieve pressure on the wishbone but again I think I will still have the issue of the bolts hitting the trunk. Really dont feel like dropping the whole rear axile to just get those bolts out. Well, since the bracket is an integral part of the rear axle and which is the only thing supporting the backside of the differential, there's almost no way around of having the rear axle dropped off the car. The two huge rear mounting stubs of the differential are also bolted to the bracket. I was talking about the spring pan bolts/nuts (top of each spring) - there are four of them at each side. Only three points are connecting the rear axle to the body. Differential monostrut, Spring (pan), a-frame bushes. 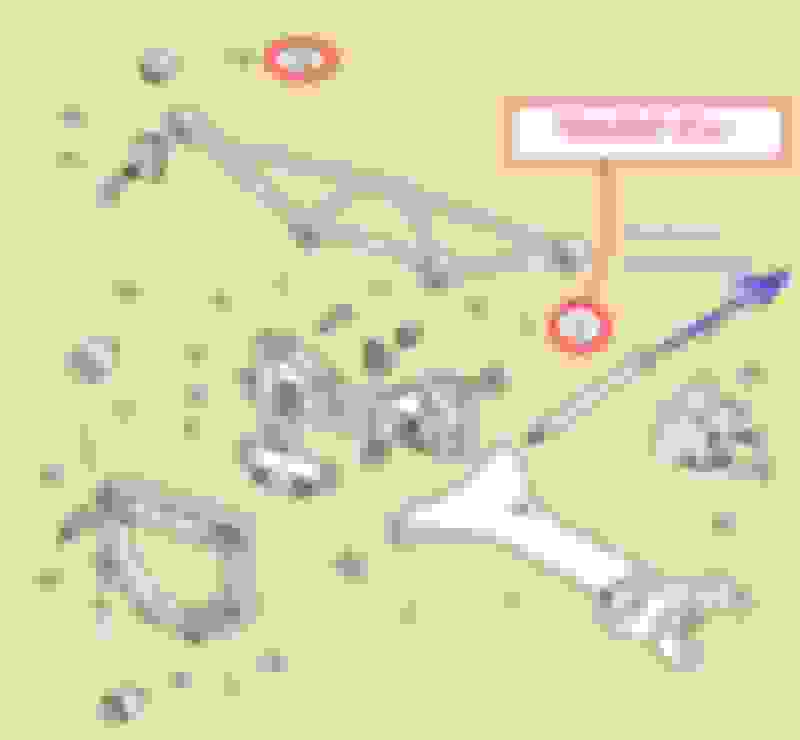 So if you remove the fulcrum bolts, the monostrut and the bracket you'll end up with a very instable rear axle assembly hanging above your head (wishbones are free, differential's back isn't supported anymore and the whole assembly has lost it's rear connection to the body. There's no need to be afraid of dropping the rear axle...it's an easy task (removal of monostrut to body bolts, removal of spring pan bolts/nuts, removal of a-frame bolts/brackets, disconnection of propshaft, hang out the exhaust mounts from the rear axle's hinges). Do a forum search or have a look into the workshop manual. Jaguar issued special tools to franchise dealers. You can rig up something or find the special tools somewhere?? Here is a TSB we got about 20 years ago. Installation is the reverse of removal. Be sure the bushing bores are clean of corrosion or remnants of old bushing rubber. Put your new bushings in the freezer for at least 30 minutes prior to installation, and take one out of the freezer at a time just before you install it. This contracts the O.D. of the bushing sleeve and makes it easier to press into the monostrut. Before you remove the old bushings, check how far they extend out on each side of the strut. I can't recall if they extend equidistantly on each end or are asymmetrical. Just check and if necessary take photos so you know how far to press the new bushings in. Last edited by Don B; 02-04-2019 at 10:48 PM. Just thought I would post this just in case anyone else needed the procedure. Thank you for reporting your success! I have moved your post to your original thread so all the relevant posts are together. S3 xj6 bumper strut removal...how?